The Eames Lounge Chair Wood (LCW), also known as Eames Plywood Lounge Chair and Low Chair Wood, is perhaps the most successful and acclaimed design of the husband and wife design team, Charles and Ray Eames. The chair was named by Time magazine as the Best Design of the 20th Century. Time justified its verdict saying: “Eames took technology created to meet a wartime need (for splints) and used it to make something elegant, light and comfortable. Much copied but never bettered.” The LCW, in many ways groundbreaking, introduced molded plywood as the new material suitable for furniture production. It brought many new opportunities for both designers and manufacturers, changing the world of furniture design forever. The history of the chair dates back to 1941, when Charles Eames and Eero Saarinen, a Finnish American architect and industrial designer, entered a furniture group made of molded plywood into the Museum of Modern Art's "Organic Design in Home Furnishings Competition", a contest exploring the natural evolution of furniture in response to the rapidly changing world. Following the competition, Charles and Ray continued their experiments with the plywood designs and molding techniques in the spare room of their own apartment. Their discoveries led to a commission from the U.S. Navy and the U.S. Air Force to develop splints, stretchers and glider shells. The splints used compound curves to mimic the shape of the human leg. The experience of shaping plywood into compound curves greatly contributed to the development of the Lounge Chair Wood. The final design of the LCW came into the limelight in 1946. The mass-produced, functional and elegant, yet affordable chair was an instant success in the postwar United States. 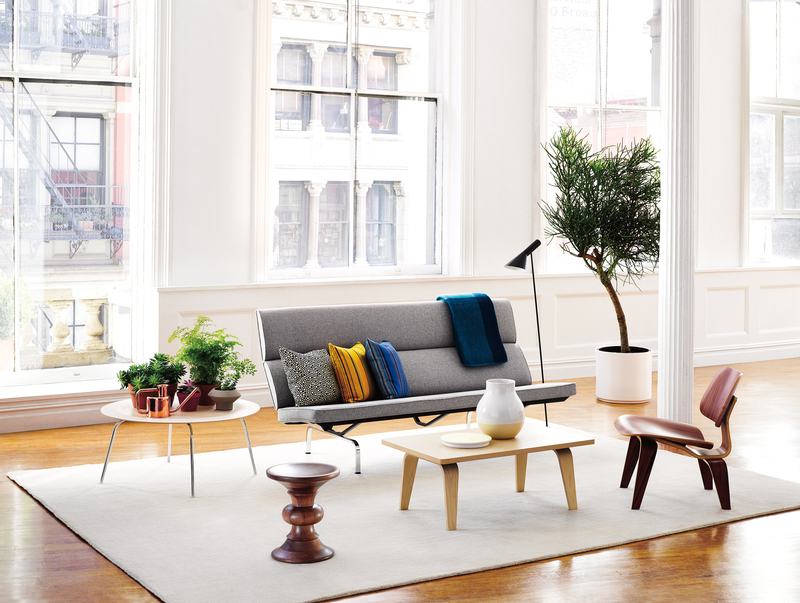 It has been in continuous production since the year of its introduction and it is still commercially available under the Herman Miller brand today. The high level of comfort offered by the chair can be attributed to its unique shape, sculpted to fit the curvatures of the human body. The form of the LCW has earned recognition around the world and has been praised by design critics. The molding process gives the plywood its gently curved, welcoming appearance. The plywood used for production of the backrest and the seat pan consists of five sheets of lightweight veneer , with hardwood inner plies. The spine and the legs are made from the 8-layer plywood for the additional strength. Dry plywood sheets are sandwiched, in an alternating pattern, together with the glue covered ones. Layered sheets are then press molded into the desired shape. Customers can choose from white ash, ebonized ash, natural cherry, birch, walnut, and santos palisander veneers. The base of the chair is available in either the plywood or the steel version. The latter one is made from welded, chrome-coated bent steel tubes. In both variants, the frame resembles a hyena, with the front legs longer than the back legs. The rubber shock mounts, yet another item on the couple’s inventions list, are placed between the frame and the backrest and the seat, which allow the chair to adapt to the user’s position. The chair leans slightly backwards, hinting at its comfortable, relaxing feel. In order to reach the absolute heights of comfort and relaxation, customers can order their Eames Plywood Lounge Chairs padded with a foam, which can be upholstered in a multitude of different fabrics and supple leathers. Designed to furnish houses of the soldiers coming back from the fronts of World War II, the Eames Lounge Chair Wood has neither aged nor become trite. It still looks fresh and contemporary. This piece of furniture is a perfect combination of an astonishing form and exceptional functionality. The runners-up in Time Magazine’s Design of the 20th Century were the S-1 Steam Locomotive, constructed by Raymond Loewy, and the Swatch watch. The Organic Chair designed by Charles Eames & Eero Saarinen for the MoMA’s "Organic Design in Home Furnishings Competition" had its backrest and seating pan joined together in a single, seamless shell. However, due to the limited knowledge regarding the plywood molding techniques at the time, the sharply curved shell was prone to developing cracks, which had to be hidden under a layer of upholstery. Following the competition, Charles and Ray spent countless hours trying to improve the chair’s design. Finally, they arrived at an alternate solution. They separated the shell into two components. The backrest and the seat pan were now joined by a plywood spine and supported by plywood legs. The lack of sharp curves eliminated the problem of cracks, thus covering the chair in upholstery was not necessary. Charles and Ray, for the sake of their experiments with the molded plywood, constructed their own molding machine, called the “Kazam! Machine”. It consisted of the frame made of wooden slats screwed together around the plaster form. Layers of veneer were covered with glue and pressed against the form with the rubber membrane, inflated manually with the aid of a bicycle pump. The glue dried over a 6-hour period, so the membrane had to be kept pressurized the entire time. The chair can be seen in the movie “22 Jump Street”. Captain Dickson’s (Ice Cube) office is furnished with two dark-coloured Eames Plywood Lounge Chairs.